Yes, that sometimes chaotic theme park in central Florida can be a romantic and fun option for the upcoming holiday. 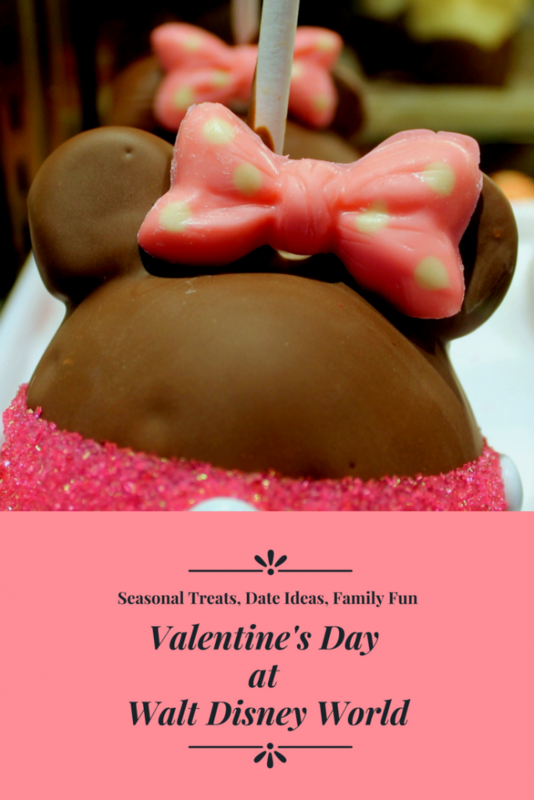 Let’s take a look at how you can enjoy Valentine’s Day at Walt Disney World! In your planning process, make sure to take the photographic tour of our favorite hotels for couples at WDW. 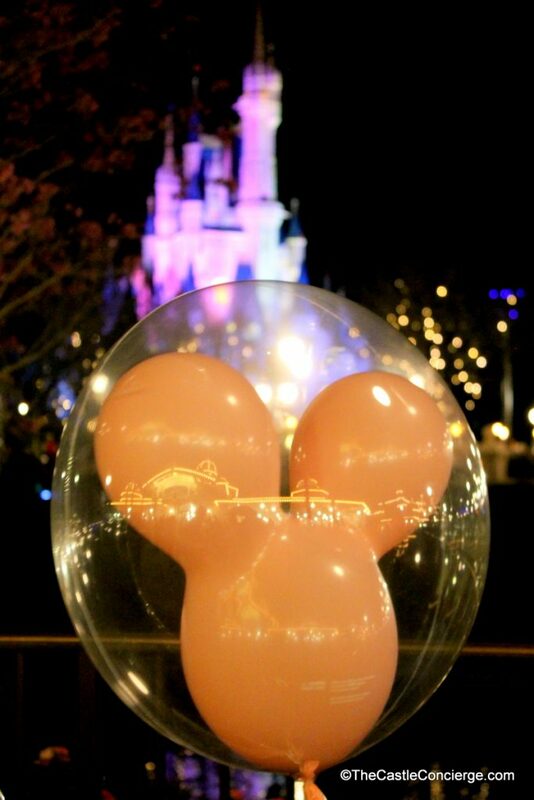 Opt for family fun, romance, or a combination of both vacation styles for your Valentine’s Day at Walt Disney World. As you plan your special day, you’ll find temptations all around the resorts and parks. From red and white festive baked goods to holding hands in the Haunted Mansion, your theme park day is sure to be a memorable celebration. Of course, you can splurge on special events, magical add-on experiences, or candlelit meals. Or you can keep it simple with a cupcake, balloon, and moonlit walk. Get your sweetheart a balloon. Whether you tour with your loved one or the whole family, be sure to get PhotoPass pictures taken to commemorate your Valentine’s Day at Walt Disney World on February 14th! 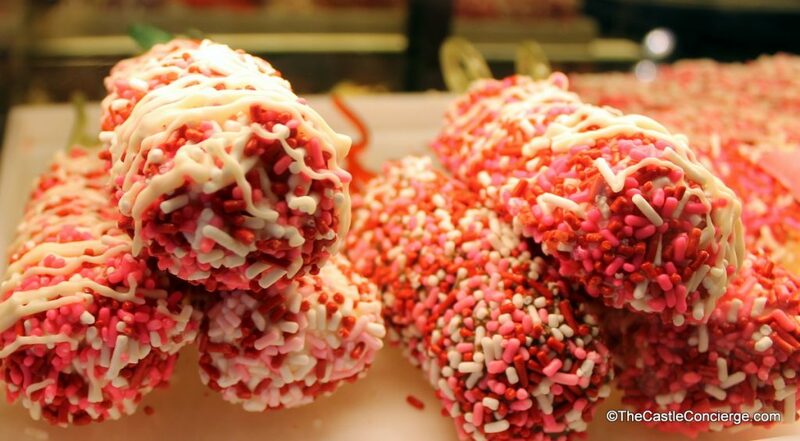 An example of the Valentine’s Day Treats that you may find in Walt Disney World. 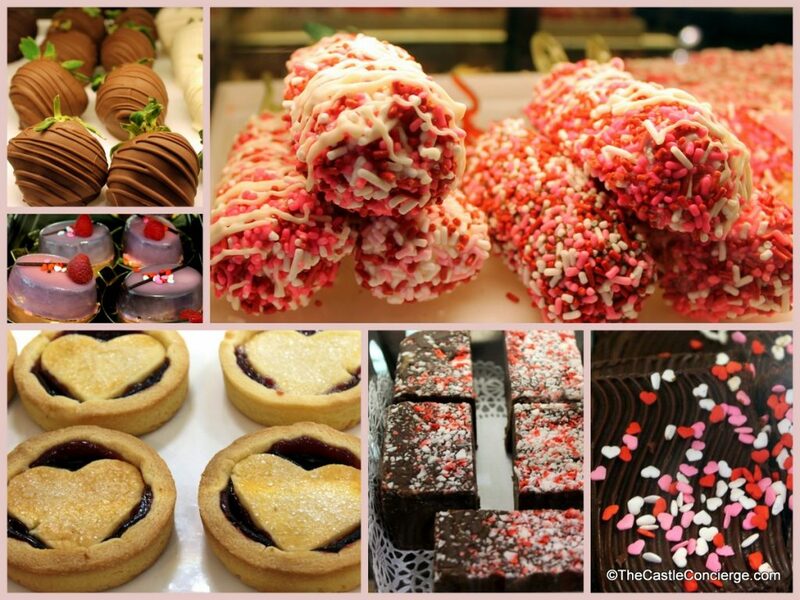 If you plan to visit the Magic Kingdom, a visit to the Main Street Confectionery is a must for you and your sweetie(s). You’ll find shopping, dining, and entertainment at Disney Springs. At Sprinkles, you’ll find new seasonal cupcakes — Raspberry Chocolate Chip or Red Hot Velvet. Or indulge in a scoops of Cherry Vanilla ice cream now through February 28! If you’re looking to impress, make an Advance Dining Reservation at the five-diamond Victoria & Albert’s restaurant at Disney’s Grand Floridian Resort & Spa. Other fine dinner choices include the award-winning California Grill at Disney’s Contemporary Resort, Narcoossee’s with its waterfront real estate at Disney’s Grand Floridan, the unique ambiance of Jiko at Disney’s Animal Kingdom Lodge, or the Pacific Northwest décor at Artist Point at Disney’s Wilderness Lodge. For in-park dining, consider Monsieur Paul and Chefs de France in Epcot, Tiffins in Animal Kingdom, Be Our Guest at Magic Kingdom, and Hollywood Brown Derby at Disney’s Hollywood Studios. 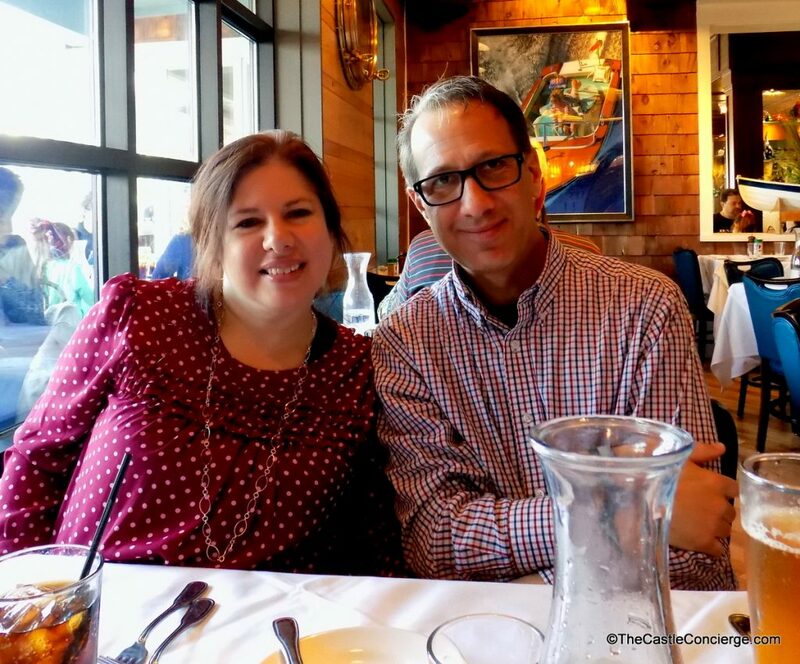 We loved our meal at The Boathouse at Disney Springs on a previous Valentine’s Day at Walt Disney World! Most restaurants will require booking 180 days in advance, especially for holiday dining. However, last minute cancellations do occur, so keep checking! Created exclusively for Valentine’s Day in Walt Disney World, Senses – A Disney Spa has announced the “Part of Your World” package. 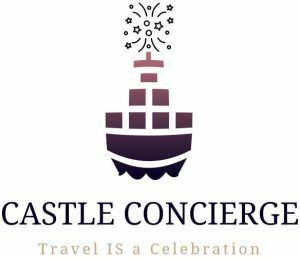 From February 10 – 18, 2018, the package includes a couple’s massage with apricot-infused body oil, a chocolate hand-hydration treatment, sparkling wine served in a chocolate champagne glass and a take-home, custom-blended bath salt. $340 (plus tax) for 50 minutes and $450 (plus tax) for 80 minutes. 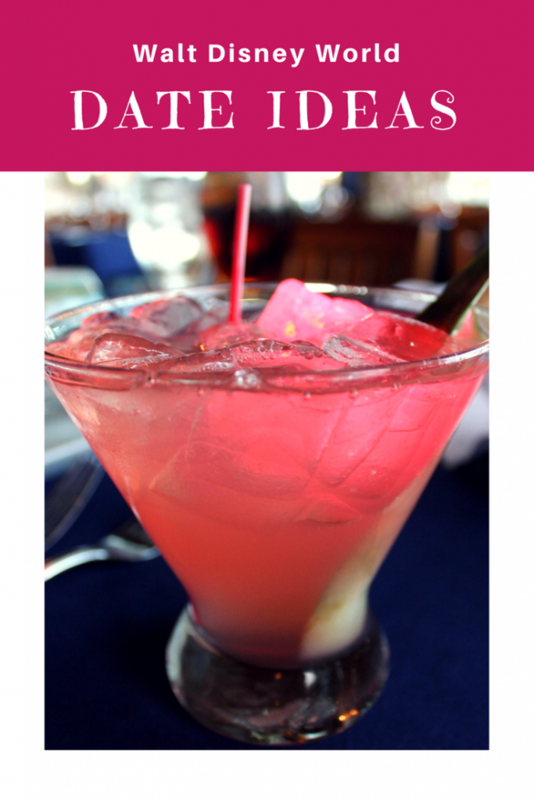 A 20 percent gratuity is added automatically. Disney Vacation Club Members (DVC) will receive a 15 percent discount by calling Member Services. To schedule, call (407) WDW-SPAS or (407) 939-7727. Dressed up for Valentine’s Day. Dine at Narcoossee’s, watch fireworks, then stop by Disney’s Grand Floridan Lobby to listen to the Grand Floridian Society Orchestra. Stroll around the Boardwalk at Disney’s BoardWalk Inn, sip on a cocktail at Belle Vue Lounge, and share an ice cream flight at Ample Hills Creamery. Keep your eye out for seasonal flavors at the specialty shops at Disney Springs. 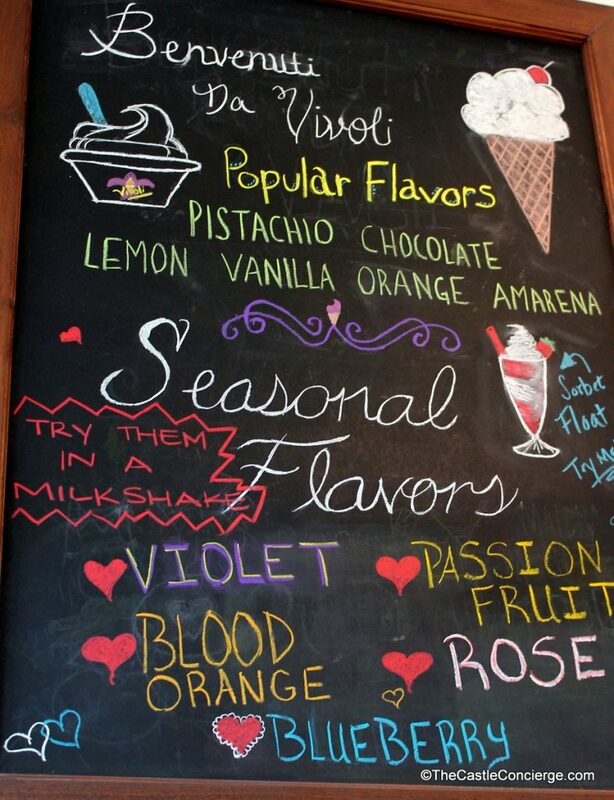 Valentine’s Day Seasonal Flavors at Vivoli il Gelato in Disney Springs. Take a moonlit walk outside and look for giraffes. Sit by a wood-burning fire and share roasted marshmallows. Wherever you roam at Disney’s Animal Kingdom Lodge, you’ll find family fun and romance due to the exotic ambiance. 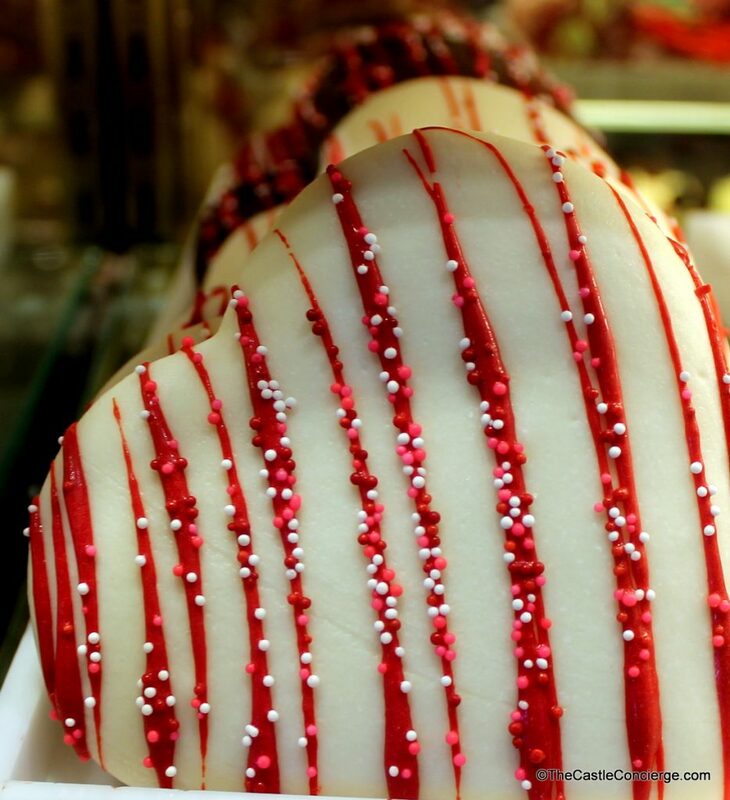 Beautiful Valentine’s Day cookie treat! From Port Orleans Riverside, take a horse-drawn carriage excursion. Reserve your extra-fee ride in advance by calling (407) WDW-PLAY. Afterwards, take the Sassagoula River boat to Disney Springs for more shopping, dining, and entertainment options. Don’t forget to get a treat at Goofy’s Candy Company! 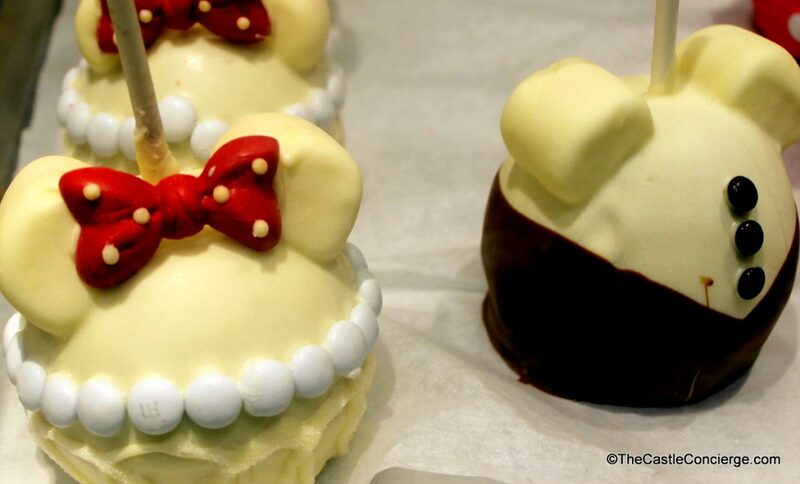 Dine at a Disney Springs restaurant, then shop for sweets to share back at your resort. Play mini-golf before heading to Disney’s Hollywood Studios. Take the plunge together on Tower of Terror. Go horseback riding at Disney’s Fort Wilderness, followed by a dinner and show at the Hoop-Dee-Doo Musical Revue. Look for Hidden Mickeys — every time you find one share a kiss. Guests ages 7 and up can learn archery at Fort Wilderness. Pick up supplies at the Meadow or Settlement Trading Post and have a picnic. 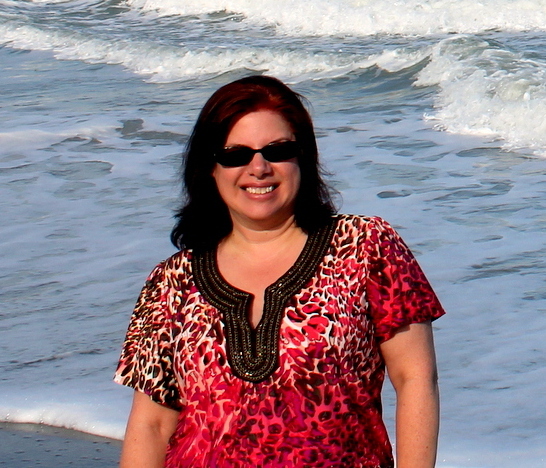 Visit a water park, then return to your hotel and sip hot chocolate. Have each family member choose part of the day’s itinerary. One person can choose where to breakfast, another can pick the afternoon activity, and so on. Finish the day with an outdoor movie at your resort. Speaking of movies, why not head to the AMC Disney Springs 24 Dine-In Theatres?! 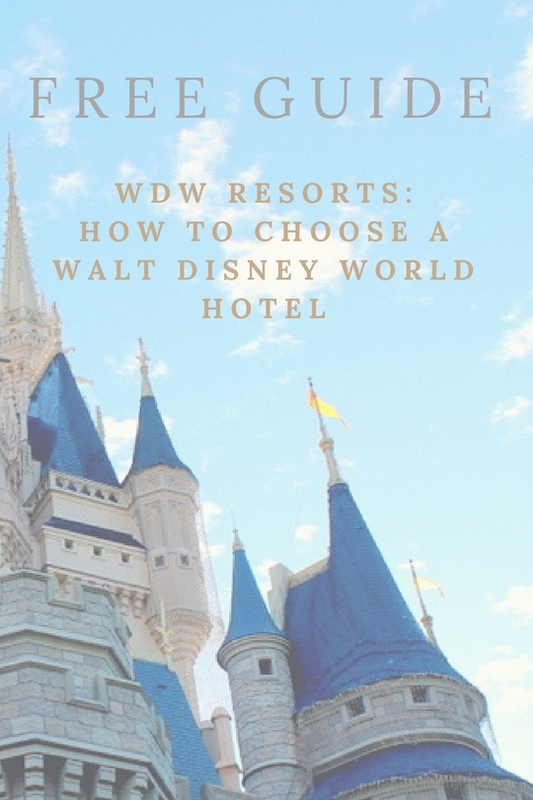 Take the monorail or boat from the Magic Kingdom to the Grand Floridian, Polynesian Village, and Contemporary resorts. At each stop, choose a favorite or new-to-you snack. You’ll find Dole Whip at the Polynesian Village. Yum! 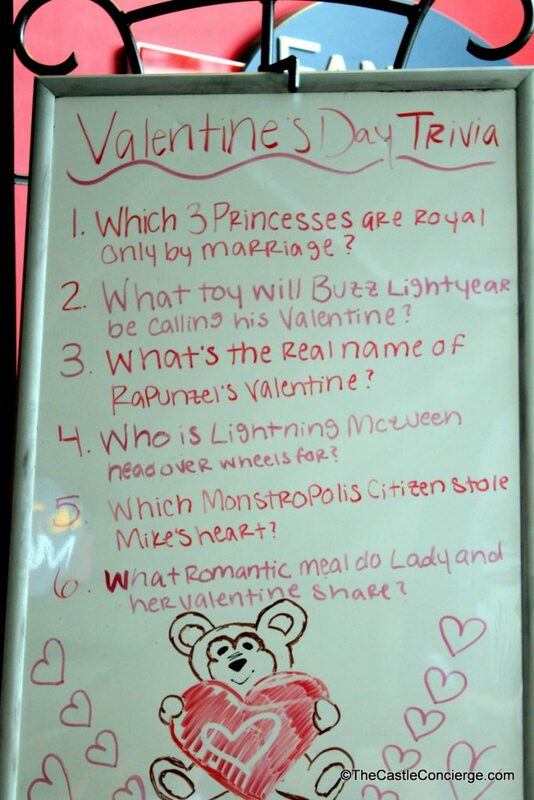 Valentine’s Day Trivia at Fantasia Market in Disney’s Contemporary Resort. The options are endless. These are some ideas to inspire you to find your own special magic during Valentine’s Day at Walt Disney World. 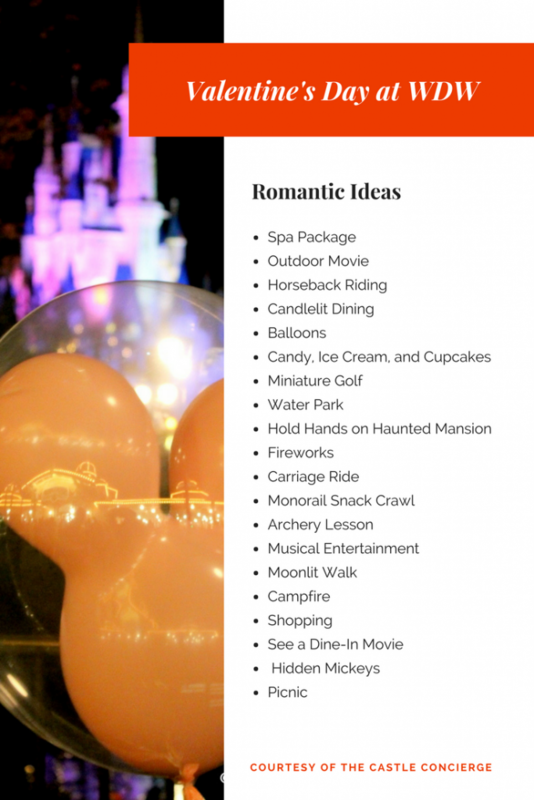 What’s your ideal date at Walt Disney World? Next Next post: Springtime at Walt Disney World: What’s Blooming in 2018?